The tips below are not have magical affects. You cannot be a better climber from today to tomorrow. And if you want to climb faster and better, you must be ready to suffer, especially in the beginning. It is impossible to write a guide like “5 minutes a day, and you’ll climb better. You won’t even sweat.” The real world doesn’t work like that. Being a better climber is both suffer and fun. It’s suffer, because you must make big efforts. It’s fun because if you climb better, especially better than your cycling mates, you feel great 🙂 And we’re cyclists, so suffering is the part of the game. Climbing hurts. But it’s a “no pain, no gain” world. Be a better climber and let the others hurt more than you. Choose hills. Most riders choose flat routes instead of hilly ones, because they don’t want to hurt themselves. Big mistake! At least two times in a week, choose the most hilly route around. To be a better climber, climb more. If you live in a flat area with no hills around, try to ride against wind using higher gear ratios. Ride 10-20 minute like that at your lactate threshold. This will simulate riding uphills. Climb with better climbers. Find some good climbers and train with them. This works best if your mate(s) slightly better than you. If they are much better than you, you’ll quickly get dropped and lose your moral. Gear combination. Choose a gear combination that enables you to cadence at least 70 rpm. Finding the gear ratio that suits you most needs a bit experience. But you can use this method: if your legs are hurting and burning, choose an easier gear (this means higher cadence); if your lungs are crying out for relief, choose a harder gear (lower cadence). If both are at their limit, and you have run out of gearing options, there’s not much you can do. Body position. Do not tighten your upper-body. It’s a waste of energy. Stay relaxed. Aerodynamics also affects your climbing speed. Basically, if you’re riding more than 13kph on a flat road (no wind), air resistance is the greatest counter-force against you. Air resistance grows with the square of your speed. 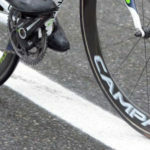 This means, while riding at 40kph, air resistance is 4-times bigger than riding at 20kph. If the climb is so steep, you may ignore the aerodynamics. But if the climb is not so steep and you able to ride faster than 18-20kph, switching a more aerodynamic position gives you a slight advantage. With that reason, Marco Pantani was holding the handlebar from drops while climbing, to get a more aerodynamic position. Choose good-rolling tires. Rolling resistance must be the key point when choosing tires. Some tires roll better while some others not. You can lose up to 25 watts with choosing bad-rolling tires. You can check out the rolling resistances of some clincher tires from here. Choose your climbing style. Usually, your heart-rate increases average 5 bpm when you stand up while climbing. But small and lightweight riders like Marco Pantani can stand with less pulse penalty because they’re supporting less weight than big riders like Jan Ullrich. To find the climbing style that’s most efficient for you, ride a steady grade that takes 8-10 minutes to climb. Do the whole hill seated at a brisk but not all-out pace. Note your heart rate and the time it takes to get to the top. Roll around for 10-12 minutes to recover, then ride the climb again-standing this time, at the same heart rate. Compare your elapsed times. Repeat several times over a period of a month to allow variations in form on a given day. By comparing times, you should have a clear picture of which climbing style is better for you. Do not start too hard. Starting with an easy pace to a long climb is better. Mentally divide the climb into thirds. Ride the first one at a moderate pace. Increase the pace slightly during the middle third. At the last third, increase the pace all the way to the top. Additionally, you can mark off Intermediate Goals: break a long climb into a series of goals. Tell yourself you’ll maintain the pace to the next turn. Once you get there, set another goal, the big tree a quarter mile ahead, for instance. You’ll be at the top soon. Start climbing in front. If you’re riding in a big group or peloton, try to start the climb in front, especially if you’re not the best climber in the group. You can limit your losses and even catch up on the descent. You will suffer. But when you get the top first, it’ll be fun. #1- Think like a climber. Think positive. These hills will improve you. #3- Find some good climbers slightly better than you, and train with them. #4- Choose a gear combination that enables you to cadence at least 70 rpm. #5- Marco Pantani, one of the great climbers of all time. Pay attention to his aerodynamic position. #7- To be a good climber, lose some weight. #8- Staying on the saddle or standing up. Which one is better for you? Try and measure to learn. #9- You can mark off Intermediate Goals while climbing. Road sings, painted columns or other objects can be a mark. #10- With starting to climb in front of the group, you can limit your loses if you’re not the best climber in the group.